–The vitals: *Nate Thompson has been traded. Trevor Lewis was spotted late in the skate working on faceoffs, and Austin Wagner returned to the room prior to the projected scratches, so expect to see a fourth line comprised of Clifford-Lewis-Wagner. This will be Lewis’ first game after a 38-game absence caused by a fractured foot suffered during a pre-game skate in Chicago on November 16. Jonathan Quick was the first goalie off the ice and will be expected to start in net versus Washington, against whom he is 9-2-0 in his career with a 2.23 goals-against average and a .920 save percentage. Jeff Carter (lower-body) did not skate with the group and is “probably a few days away yet before he’d be back,” per Desjardins, so there’s no firm update there. –Their vitals: Pheonix Copley will start in goal, per Isabelle Khurshudyan, who also noted forward groups of Ovechkin-Kuznetsov-Wilson, Vrana-Backstrom-Oshie, Burakovsky-Eller-Connolly and Stephenson-Dowd-Smith-Pelly with defensive pairings of Kempny-Carlson, Orlov-Niskanen and Orpik-Djoos. The 6-foot-4 Copley, an Alaskan, played one season of minor hockey with the Simi Valley-based California Titans when he was 17. He has never faced the Kings in his career. The Caps are healthy and do not have anyone on injured reserve. Hagelin really enjoys playing at Capital One Arena, citing the emotion and “a fun style of hockey where there’s a lot of up and down.” Excluding goalies, the Caps currently have 11 players who stand at least 6-foot-2. –Jonny Brodzinski (shoulder surgery) is getting close to a rehab assignment, which could come as early as this coming weekend, per hockey operations. He still needs another practice or two with contact, but once ready, he’ll be placed on a conditioning loan in Ontario for three games with an option to extend the stay, similar to Gabe Vilardi’s assignment earlier this season. Ontario has a home-and-home with Bakersfield this weekend – the Friday game is at Citizens Business Bank Arena – before hosting Stockton, San Antonio and Colorado next Wednesday, Friday and Saturday. Because his injury wiped away virtually all of his season, the Kings won’t be able to retain his rights past July 1 in the absence of a new contract. Similar to Kevin Gravel last year, he will not have played the requisite games to become a restricted free agent, making him a Group VI UFA. If the Kings want to sign him, they’ll be able to sign him, but there could be some competition if Brodzinski decides to use his leverage and wait to see if a slightly more lucrative or desirable contract comes about. –You always come away learning something from Dustin Brown, and on Monday morning, while discussing the team’s practice habits and the physical and mental strain associated with longer road trips during the dog days of the season, he shared a little nugget that I found interesting. You may recall that prior to the bye week(s), the Kings were dealing with some challenges in their attention to detail in practice and game situations – there was one particular morning skate prior to the home game versus Pittsburgh in which the detail was noticeably absent – and while answering a question about the team’s improved forechecking and structure, he shared that the detail was something the team addressed prior to traveling east. “That break, we addressed a few issues that we probably had as a group about our practices, and I think our practices have been better, and I think as a result we’ve been better in games,” he said. I asked Willie Desjardins if he felt there was a prior “lull” in the team’s focus that had been corrected, and he shared something similar. “When you watch it, it’s hard to see. But if you practice hard enough, then games are easy, and I think for us, our practices weren’t quite there, so when we got to a game, we’d have to step it up, and that’s harder to do,” Desjardins said. The structure and ability to exit their zone cleanly has raised their play of late, and even the pre-break play in which the detail may have waned was part of a stretch in which they’ve gone 12-7-2. But it was still interesting to hear that it was something that was noticed and addressed. Anyway! Back to my original question to Brown. The mental part or the physical part – what’s harder when you’ve already moved past a four-in-six and have been on the road for a week and a half? 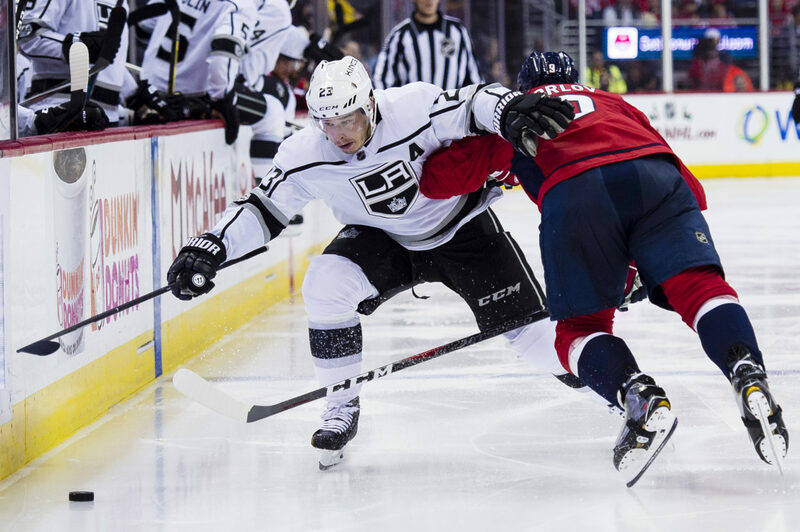 –Brendan Leipsic will be my guest on the LA Kings Live pre-game show. Tonight’s officials are referees Brad Watson and Brad Meier and linesmen Pierre Racicot and Mark Shewchyk. Thanks for checking in on a busy Monday, Insiders. Let’s talk soon.